I read an interesting blog post from web usability guru Jakob Nielsen the other day in which he revealed that web users spend 80% of their time ‘above the fold’ (the section of a webpage that can be viewed immediately on a standard resolution screen without the visitor having to scroll down the page). And when they do make the effort to venture south, they allocate only 20% of their attention to what they are looking at. 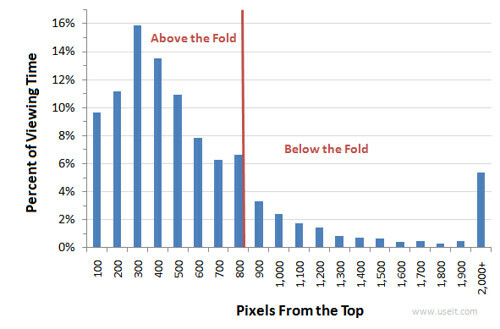 Nielsen conducted an eyetracking study of user behaviour across a variety of sites to investigate whether the “fold” continues to be relevant, looking at a total of 57,453 fixations (instances when users look at something on a page, typically for less than half a second). For me, there are two key learnings here. Firstly, it is important that any critical information is kept above the fold. Of course, this isn’t always possible, especially with pages where the call to action or ‘important information’ might vary for different people. This advice applies to web designers and developers, but also to email marketers. Knowing how your visitors are likely to use your site is a crucial way to ensure that your website content is effective in converting them to customers.